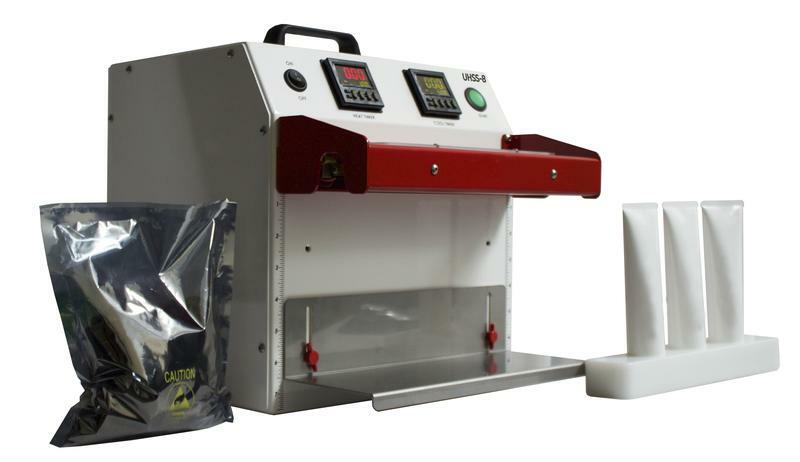 UHSS-8 Tabletop Tube Sealer with Self-Contained Compressor — Sealer Sales, Inc.
Seal up to 3,500 tubes per day! Ideal for laboratories, research facilities, R&D, and quality control groups. Unit is economical, safe and very easy to use. The tube sealers can be used on all polyethylene, and laminated tubes. Sealers are equipped with a stainless steel shelf with height gauges to allow for easy changeover of various height tubes. Included is a custom tray made for your tubes (sample tube required for fabrication). Remember: When you order, please also send a sample tube if you want a custom tray fabricated for your tube. Dimensions 13" x 15" x 15"
Spare Parts Kit includes: (1) Heating Element, (1) PTFE Insulator (under element), (2) PTFE Zone (over element) - dual kits include 2x.